BIG SUR, CA -- The Dirty Harry style, Clint Eastwood was explaining, is simplicity itself: "You start with this ultimate fantasy character, this guy who's always fighting the establishment, who isn't interested in the intricacies of society, who tells his boss to go to hell. You equip him with a .44 magnum, pointing out that it's the most powerful handgun in the world. You make him a cop and send him out into the streets. And you whittle down his dialog." Eastwood, as unlike this description as possible, was sipping herb tea on a veranda overlooking the Pacific. The dry December sunlight spilled down and the hills of Big Sur rose behind him, and his dialog wasn't whittled down at all. Among other things, Eastwood talks a lot more than the characters he plays, perhaps because he has more to say. "The movies all begin in the same way," he said. "There's a dramatic scene, violent and sometimes humorous, that establishes his modus operandi. Then you get on with the story. It's a format that appeals to audiences. I guess it appeals to me, too, or I wouldn't do them. But 'The Enforcer' will probably be the last time around for Harry. After the first one, after 'Dirty Harry,' I said the same thing. But you get a good script, and you have to consider it." 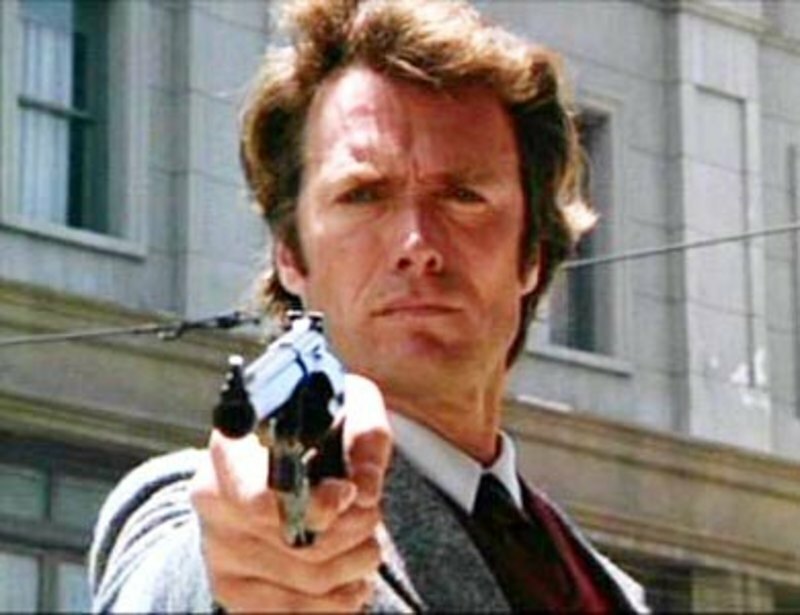 The story behind the screenplay of "The Enforcer," which is Dirty Harry Callahan's third adventure, is one to gladden the hearts of would-be writers who dream of selling an original script to the movies and retiring in, say, Big Sur. Two film students, Gail Morgan Hickman and S. W. Schurr, came up with a new premise for Harry: Give him a female partner. They wrote 70 pages of a screenplay and then discovered how hard it is for unknowns to get their work read in Hollywood. They knew Eastwood lived near Carmel, on the Monterey Peninsula not far from Big Sur, and that his offices were upstairs over the poetically named Hog's Breath Restaurant. So they dropped their screenplay off with the bartender and asked him to give it to Eastwood the next time he came in. "People are always sending in material," Eastwood said. "Usually we don't have time to read it. And you have to get a legal release to protect yourself against charges of plagiarism. All those sorts of things. But, what the hell, I looked at the script. I liked the idea of Harry working with a policewoman. There were a lot of things wrong with the writing, but some things were right, and it had youthful vigor to the writing. And nice, sparse dialog. So we, bought it and put a couple of writers on it, and that's why there's another Dirty Harry movie." He squinted into the sun and sipped his tea. He looked at home here, silhouetted against the worn California hills. He wore a cotton shirt open at the neck and blue jeans, and from a certain point of view you didn't see anything but Eastwood and the hills, and it could have been a Western. From another point of view, though, you saw brunch. Eastwood has lived on the peninsula, on and off, for 15 years. He's settled here permanently for the last seven, and just moved with his wife and family into a new house he designed himself. His first film as a director, "Play Misty for Me," was filmed in Carmel and along the Monterey coast, and he still sees it as his breakthrough: After he played a disk jockey in it, Hollywood was finally able to imagine him as something other than a cowboy. "I had a lot of success with the Westerns I made with Sergio Leone," he said, deliberately not describing "A Fistful of Dollars" and its sequels as "Spaghetti Westerns," a term he could do without. "But there was still this snobbishness from the Hollywood studios. They weren't ready to take me seriously. So I came over here and made 'Hang 'em High,' which turned a profit in 10 weeks flat, so then they'd take me seriously as a cowboy but nothing else. Then I made 'Coogan's Bluff' and 'Dirty Harry: Jeez, they say, maybe he can play a cop, too. But nothing else. "I wanted to direct a film, and I had the script for 'Play Misty.' It was written by a girl I used to drink beer with when we were both starting out. I could have convinced a studio to back a Western in a minute, but they didn't see me as a disk jockey. I mean, think a moment. Why was this character such a departure? I was playing a character my own age in a contemporary story, set in the town where I live. Now I know I couldn't make a living as a cowboy or a cop -- I'd be no good at either job -- but I could probably earn a living as a disk jockey. So what was so strange?" There was another problem, Eastwood said: The studio didn't like "Play Misty for Me" as a title. "They said there'd never been a hit movie without a good title. Give that a moment's thought. It's true by definition. Anyway, they have a title I can use: 'Strangers in the Night,' from the song. No, I say, I don't like it. They think and think. They come up with a compromise title: 'Play Scoobie-Doobie-Doo for Me. 'Uh, fellas, I say, I think I got a long-distance call..."
"The Enforcer" was originally titled "Moving Target," Eastwood said, but he thought "The Enforcer" had a better ring to it, and he bought the title from an old Humphrey Bogart movie. The all-time bad title he has been involved with, he said, was the title of the book that "The Outlaw Josey Wales" was made from. "They published it as "Gone to Texas," he said. "Grabs you, huh?" "Play Misty" had Jessica Walter in an unforgettable role as a woman who became homicidal when she imagined she'd been jilted. "The Enforcer" has Tyne Daly as the rookie policewoman whose life becomes incredibly complicated after she gets Harry Callahan for a partner. Eastwood has hardly ever starred with Hollywood actresses who are conventional beauties: His women always look more, well, individual. "Yeah, that's the way it usually is," he said. "Maybe because I was pigeon-holed for so many years in one kind of role, I hate typecasting. I like to cast people in my films who look as if they could be somebody. The gals we cast don't go in much for mascara, false eyelashes, dark glasses, autographs and the rest of that crap." Another good piece of casting was when Eastwood hired Chief Dan George, the Indian who became a star after retirement age, as his sidekick in "The Outlaw Josey Wales." "Organic actors. They don't have any insecticides on them." Brando was In "Missouri Breaks" with Jack Nicholson, and Paul Newman and Robert Redford have worked together, and Redford and Dustin Hoffman, and Hoffman and Steve McQueen...Why hasn't Eastwood ever co-starred with another major male actor in what Hollywood calls a Buddy Movie? "Well, I've thought of it and talked about it. I talked to McQueen once, and to John Wayne...that would be interesting casting, John Wayne and myself...but we've never had the right story. That's 95 percent of a movie, the story. If you start without one, you're dead. Maybe Charles Bronson and I could make a movie together...."
"In 'The Enforcer,' what's nice is that the buddy is a girl," Eastwood said. "It's a good relationship. I talked to a lot of cops, I asked them what the worst possible situation would be, and some of them said it would be a female partner. Especially the cops who'd never had one. So we built on that. Like in the oral examination the girl has to pass, the way Harry browbeats her. And then he finds out she's a brave, loyal, good person it gives Harry a new dimension. "But, basically, he's the same person. His code is that things that are wrong should be stopped. Period. He has no politics, no interest in politics. People who say he's a fascist are full of crap. He just wants to do his job. And the films work on a popular level. "Some reviewers resent it that the films strike a popular chord, and then they go out and find films that don't work and find strange reasons for praising them. I like films that are exciting, that scare me. I loved 'Jaws.' There's a certain prejudice my films are up against, but they all seem to do well at the box office, and nobody pays three or four bucks to watch a pile of crap." Eastwood poured some more tea into his cup and looked up at the hillside. "It's nice here, isn't it?" he said. "You come here once, you fall in love. It's more beautiful than the Riviera. I commute to L.A. Why not? I was lucky; I found this place 15 years ago and bought land then. I have about a thousand acres." "A couple of deer who have taken to dropping in on a fairly regular basis."